The walk was fairly uneventful. Lots of people with a variety of dogs, and far too many cows. I had to walk through a number of fields where the blighters seem to take delight in hanging about near the exit stile. In one field I was edging gently past some bullocks to cross a ditch when one came up behind me with a ring in his nose with spikes on – more like a knuckle duster than an ordinary nose ring. 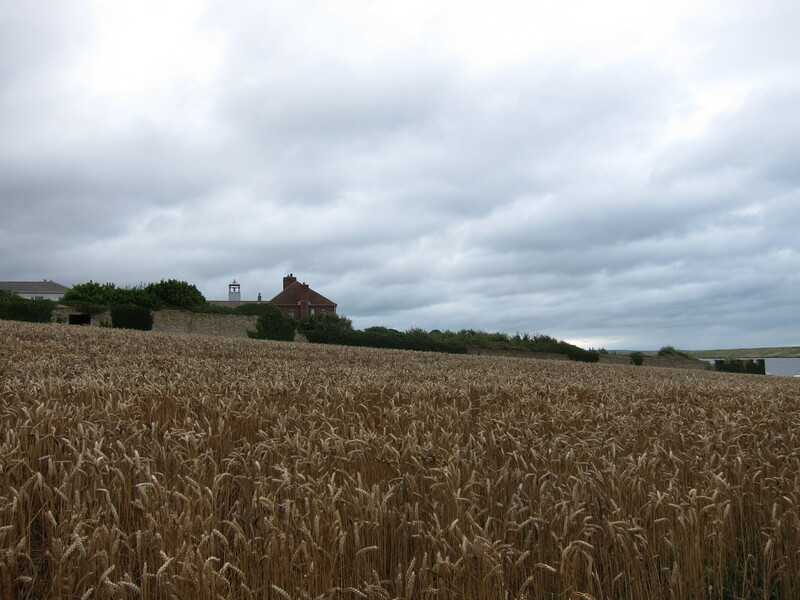 I beat a hasty retreat and had to walk around the edge of two fields to get round. Several more fields with a variety of bovines, but none as threatening. One where a cow was standing directly in front of the stile – fortunately it was next to a gate so I hopped briskly over. I can be surprisingly nimble in these circumstances! The path wound past Moonfleet Manor, and I was rather excited to see it marked on the map as a hotel. Moonfleet, by J Meade Falkner was one of my favourite books as a child and I was keen to see the manor which features in it. Unfortunately, it was surrounded by a very dilapidated wall with the entrance nowhere near the path. I didn’t want to persevere as it had a rather sinister and uninviting air. I reached the Swannery at Abbotsbury at lunchtime. I didn’t go in, but it looks worth a visit on another occasion. 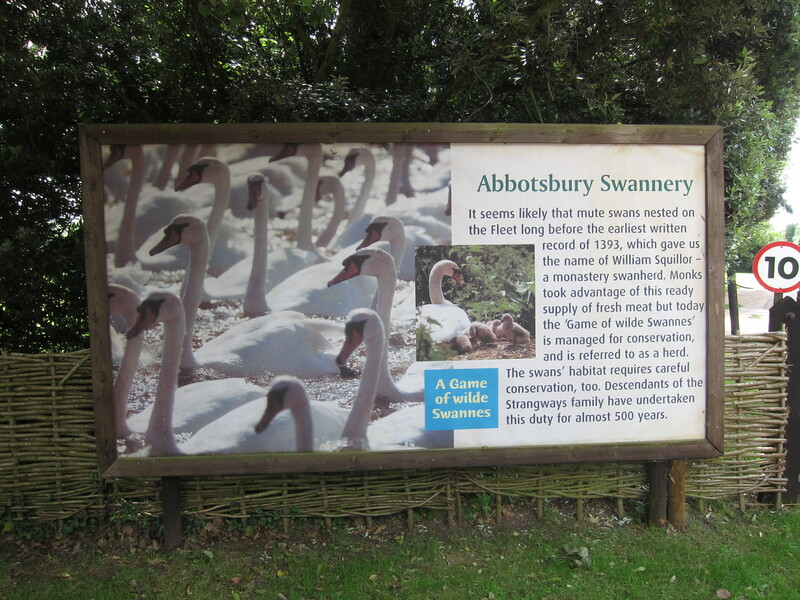 It seems there has been a swannery here since the 11th or 12th Century, under the auspices of the Benedictine Abbey. Several hundred pairs of Mute Swans nest here each year. 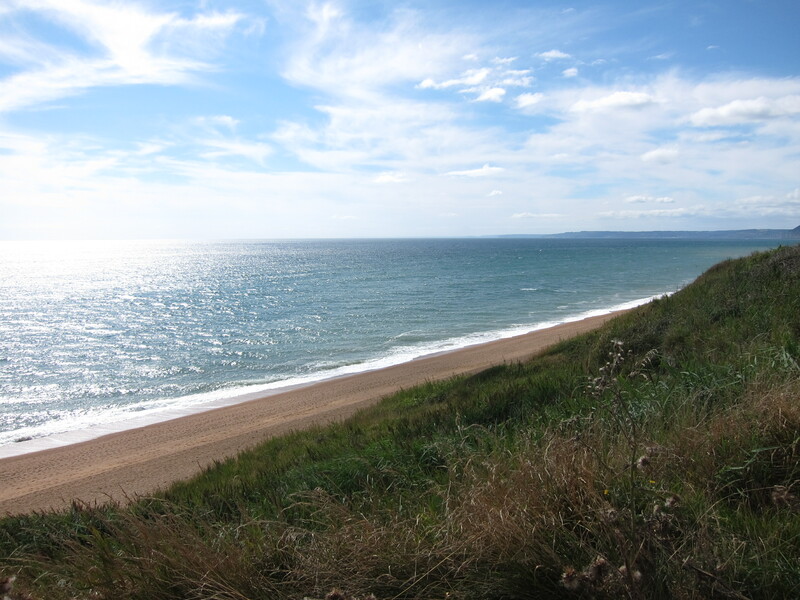 The path then continued to hug the shore past West Bexington and Burton Bradstock, with a couple of very steep up and downs towards the end that rather took the wind out of my sails, before ending in West Bay, where I diverted inland to Bridport – a good mile extra. I am sitting in the hotel waiting for my friend Tom to arrive, to walk with me tomorrow. Just under 21 miles in total. We had a rather posh pub meal at the Bull in Bridport – excellent Venison burger. The hotel is nice, but rather expensive. My room is so tiny I have to climb over my bag to get into bed, but our host is a pleasant chap and shared a nightcap with us in the little bar, telling us about the all of the arts events in Bridport. Bridport is an interesting place, lots of different church denominations and a real mix of architectural styles. The route down to West Bay, up which I walked is the Monarch’s Way, reputedly the route Charles II took after the Battle of Worcester to escape to France. Above one of the high street inns is a sign saying he stayed in Bridport on 23rd September 1651.